Which is best Best Reference Books for Class 12 CBSE Maths? Confused? Let’s make it easy. Go through the article and get rid of the confusion. Choosing a good reference book for your 12th standard? Sometimes it becomes a complicated situation for class 12th board aspirants as it is going to be a big investment for you. It sounds weird, right? some of you might be thinking how a book is going to be a big investment. But yes this is the reality, don’t get confused, I am not only talking about capital that you are going to invest, but equal amount of your time is also going to be invested, because you are going to put a lot of efforts in understanding the topics covered in the book. We Are not going to defame any of the authors here, as everyone is putting their level best, putting their hearts and souls into writing that book, the variation is just seen in the art of presentation or describing topics, some of the authors describe it in a very easy way and on the other hand some mould the topics a lot that it requires a deeper understanding with the topic. Weather you are curious about concepts you must read reference book but if you just want to know now which type of question will come into the exam or want to know the sample paper for cbse class 12th, then you should look for practice paper of sample paper. Mathematics is such a subject that requires complete concept building. Formulas are must to understand mathematics. Formulas are something we can say “the roots of Mathematics”, if once you’ve got excellence in formulas and their derivations, no such question is there that you cannot solve. These are the building blocks of mathematics. Now when we are saying formulas, do not just restrict yourself to that, do not live in a fantasised world that now i know formulas and these are enough for me to sit in the examination, practice questions also. Mostly 70% of the students with science plus maths background plans to appear for JEE, which is quite a tough level examination and it requires a lot of practice, hard work and dedication to clear both the stages of JEE to get your seat into IITs. If you want to prepare only for your board exams then solving complete NCERT will be enough for you, because in your board examination almost questions are framed from NCERTs only but you will have to put all your heart and soul into practicing questions from this book, you will have to understand the methods of solving questions. NCERT is your course book, so your first priority should be solving questions of NCERT book, and do not forget to solve miscellaneous questions and example questions too. This book is one of the best and famous book for Mathematics. Buy this book now available at just Rs 160/- Buy this book from the link given below. Pros: Board questions are mostly framed from your course book, so NCERT will be helpful if you are restricted only to the preparation of your board examinations. This book will be helpful as it gives a clear cut idea of syllabus and the topics that will be covered. Cons: If you are thinking of appearing for competitive level examinations also, then this book will not be enough. Although pattern and concept is going to be the same and questions are also framed taking NCERT into consideration, but you do not get variety of questions to practice that how questions can be moulded to other form. Reference book is a must practice book if you are determined that you have sit in examinations like JEE, NDA and clear them because the level of competition is so tough there that it becomes quite challenging to pass the exam. There what helps you is your practice of different-different types of questions and tricks of solving them and this you can only understand if you practice questions from reference books. So, here i am going to provide you all with a list of some reference books that you can purchase and practice a variety of questions from them. R.S aggarwal is a reference book where you will get every detailed and each problem’s solution. new edition is ready for upcoming board exam so keep it in your mind to cover whole syllabus with detailed. If we talk about R.S. Aggarwal, then it is a complete book in itself, providing you with ample amount of questions. We can say that it is a complete bank of questions, if you are determined of solving the complete book. NCERT with R.S. Aggarwal is the best combination to score good marks. Buy this book at just Rs. 710/-. Pros: You will not see much repetition of same type of questions. It is somewhere a book which you study by heart will not disappoint you and help you in scoring good marks. Explanation part of every question is given in such a way that it becomes easy for us to understand the solution of questions. Cons: More of its part is concentrated towards NCERT, which makes it easy for the reader to understand NCERT, but if we talk about competitions, which many of you are surely going to appear for, then portion of competitive level questions is less so that you will have to rely upon some other books. R.D. Sharma is a complete book in itself for every purpose, if you are using R.D. Sharma with NCERT then there is no need of thinking about some other book as this book contains every type of question, so that you can easily rely upon this reference course book. But this now at Rs. 735/- From the link below. Pros: Explanation of every question is given in such a wonderful way that it becomes easy for us to understand the tricks and method of question. It covers all the questions of NCERT with their explanations and it is not only restricted up till this, it is a complete package of question for competitive purpose too. It has a lot of questions that has been asked at JEE Mains and Advance, so it gives you a clear view that what type of questions are asked in these high level competitive exams. Cons: This book pays more attention towards the questions that are asked in competitive level examinations, so for those who are completely focused towards their board examinations, this book somewhere becomes a lot confusing for them as same type of questions are asked multiple times and that what questions to practice or what not. M.L. Khanna is a good book. This book is complete in itself from everywhere. It is such good that if you solve it fully with complete dedication along with “Engage”, then it will surely help you and not only in your board exams but will help you with clearing your JEE too. Pros: Its advantages i have already told you. This book along with “Cengage” is going to be a lot beneficial to you with covering all the topics of your board examinations and competitive too. So, purchase this book and start your preparations from the very first day to get good results at the end. Cons: If i talk about cons then i personally feel that there are no cons within this book, only thing that you will find irritating is that same type of questions you will find multiple times, but once you understand the pattern you can also escape these questions. Although if you practice each and every question from course book and reference book then it is enough to achieve good marks, but i personally feel that you should also practice from sample papers, previous year question papers to for the sake of your satisfaction that what type of questions you will see in your board examinations and after a lot of hard work are you able to solve them. So, once you are done with your course book and reference book then go for sample papers, previous years question bank, etc.. I am recommending you all with some practice books names that will surely help you with knowing or judging yourself that at what level you are and how much more dedication and hard work you still need. So, here i am presenting you with some good books. This book will definitely help in with the practice of your board examinations. These are last 10 years chapter wise question papers along with their solutions. So, purchase this book to get a clear idea of how questions are going to be framed. These are actually of two types, one is last 10 years question papers chapter wise solutions and one is Arihant sample papers. Both are good in their own ways, do purchase this book and practice all the questions without even escaping a single question. 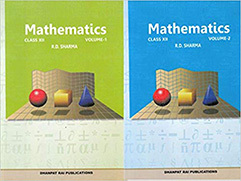 NCERT Book for mathematics is now available at Rs 160/-. I hope from the name of the book itself you’ve got the idea that this book is all about giving you a brief idea of examination. Once you complete your course book and reference book that you took into consideration, you can purchase this book and practice all the questions that are there in the book. Do not miss even a single question, because we do not know where our luck will work and the same question strikes us during the examination. Xam idea, which will be suggested you 7/10 so you must think about this book to the better preparation. Buy this book from the link given below. Let we clear that many question comes from the previous year board question papers. What all books you should study to clear your board examinations with really good numbers and if you are aiming at appearing for competitive level examinations what all books you should study. Another beneficial book for board aspirants, you can even buy Together With. Providing you with all the sample and practice questions this book has helped a lot of board aspirants to score good in the examination. So you can even go for this book if you wish to. Buy this book at just Rs 201/-. One more great choice by board aspirants, you can even purchase NCERT Exemplar. So you can even refer this book as it is equally helpful like others are. This book has always proved itself to be helpful with preparation of board examinations as it contains all the difficult types of mathematical problems that have appeared in the previous years and most of the time 50-60% chances are there that similar ones could be asked again and let me tell you, not only board examinations it is also beneficial for those who are preparing for engineering entrance exams like JEE. Buy this book at just Rs. 159/-. We all know that where the level of competition has reached. So, now it has become an important need for each and every one of us to stay in the game, we could not let ourselves get defeated. And only by thinking that we will work towards this nothing is going to happen. If you actually want something good to happen with you, then you will actually have to work towards it. Because there is nothing without working hard and smart. So, i am suggesting you some good books that you do have to purchase if you really want to have a bright future. Earlier there were only NCERTs and we were satisfied because we knew that it is the only alternative with us, if we want to study, we have to cover the topics only by this book. That was the only option left. But with growing years, now there is a great number of authors writing their own books. Now, this is completely a confusing state of mind for the students, which book is to be taken into consideration and which not, as i have told you earlier also that it is a big investment. So, now it becomes a bit challenging that who is going to be the best publisher for me. Complete Mathematics JEE Mains: This book is specially for JEE Mains aspirants who actually want to make it to IITs. Its written by Tata McGrow Hill Education. Modern’s ABC of Objective Mathematics for JEE Mains: Again a very useful book that will surely help you to make it to JEE Advance. IIT Mathematics: Such a wonderful book written by Prof. M.L. Khanna and J.N. Sharma, that will surely help you to clear both your exams i.e., JEE Mains and JEE Advance. Nirali Mathematics: This book is very helpful if you are planning of ISEET, AIEEE and JEE (Mains & Advance). Isn’t it wonderful, a complete package you are getting within one book. So, if you are planning something like this, this book will help you a lot. Arihant Objective Mathematics: Arihant Publication is always wonderful for every type of examination. So, you can even purchase this book for JEE Mains & Advance, AIEEE and other related engineering examinations. Not only science background students, but the students opted for commerce with maths also need to work a lot hard in mathematics. Mostly commerce background students aim at appearing for C.A. i.e., Chartered Accountant examination, and it requires that your basics of mathematics should be strong. So, these are some good books that will always prove themselves to be beneficial to you. Although every book is nice as we got to learn something new. But these are some books that have actually proved themselves to be helpful for the candidates and the rest was their hard work and dedication towards their goal that they had achieve by anyhow. So, we hope the content was helpful to you and you will also work exactly the same way to achieve something great in your future. Thanks for paying attention and good luck for your exams.